Cycling is increasingly becoming part of our everyday routine. Not only does it keep you fit, but if you cycle to work you also avoid the often uncomfortable commute and – let’s be honest – no one enjoys squeezing onto packed trains and busy buses. But how about an alternative cycling route? Swap the backdrop of grey buildings and lines of traffic for snow-capped mountains and rural paths; head to Nepal for an adrenaline-fuelled cycling holiday as you journey through the world’s deepest gorge. Arrive in Kathmandu and soak up the sights before five days of pulse-racing action begins. You will be flown by helicopter over the Himalayas to reach Throng-La, the starting point for your downhill, thrill-seeking challenge. ‘Easing you in gently’ isn’t a familiar phrase here; you’ll follow a steep and rough path as you begin your white-knuckle descent. Break up the journey with welcome stops and teahouses along the way until you arrive in the village of Muktinath where you will spend the night in a local lodge. 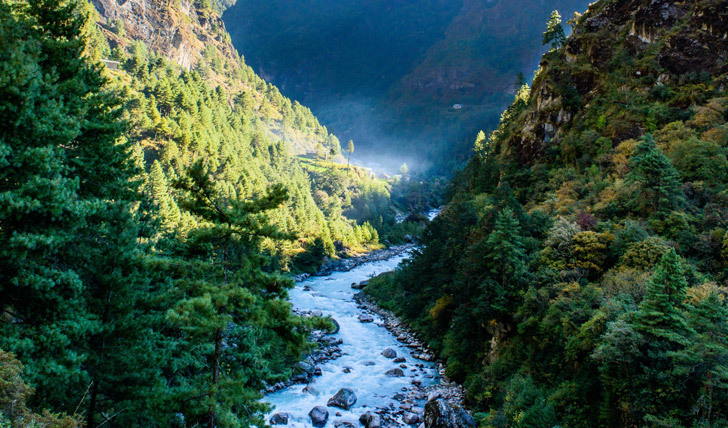 For the next four days, you will steadily make your way down the valley following the Kali-Gandaki River through villages, farms, terraced paddy fields, dense forests and over suspension bridges. You will pass through diverse landscapes from dry, arid desert to lush pine and conifer forests and see the three highest snow-capped mountain ranges – Mt. Annapurna, Mt. Dhaulagiri and Mt. Manaslu – not your average dual carriageway. En route you will also get the chance to stop off and explore the different villages, mixing and socialising with the locals. Make sure you sample the apple produce from cider and brandy to juice in Jomsom and ease those aching muscles in the hot spring pool at Tatopani – the perfect way to rejuvenate. When the trip comes to an end you will be driven to Pokhara for a night of rest and recuperation before heading back to Kathmandu and catching your flight home. This spectacular journey takes you off-the-beaten-track and deep into a world of undiscovered beauty. It’s time to get active, explore and come home with a sense of achievement. Say goodbye to traffic and hello to extreme adventure.